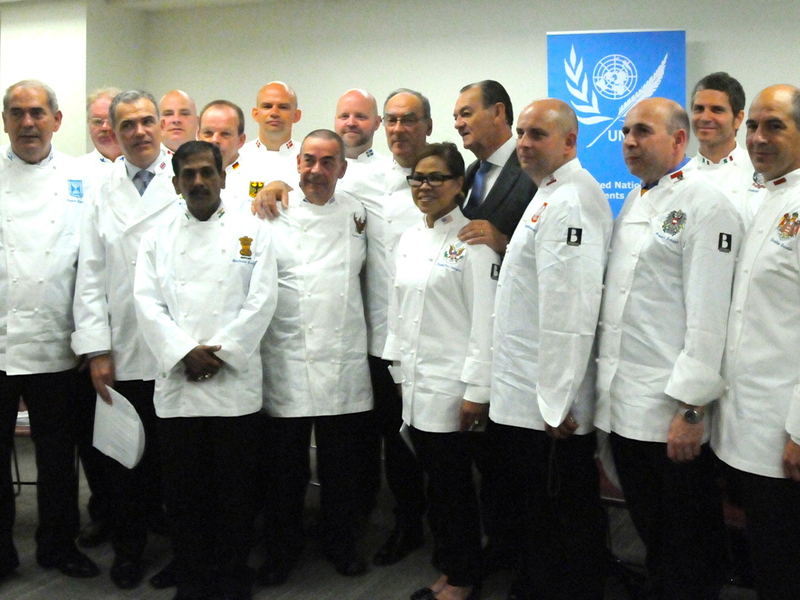 UNITED NATIONS The self-dubbed "most exclusive gastronomic club in the world" - chefs to the world's presidents and potentates - visited United Nations headquarters this week as part of a tour along the East Coast. In addition to President Obama's executive chef, Cristeta Comerford, and the chef to Britain's Queen Elizabeth II, Mark Flanagan, the contingent also included chefs from Austria, Canada, China, Denmark, Finland, France, Gabon, Germany, India, Israel, Italy, Monaco, Poland, Sri Lanka, Sweden, Switzerland and Thailand. Who is the food taster? Is there "nutri-security"? Reporters wanted the low-down on what the 19 chefs served presidents and royals. "Discretion is of paramount importance," said Gilles Bragard, the executive secretary and creator of the Club des Chefs des Chefs, a non-profit founded in 1977. "The chef," said Bragard, "and he or she is ultimately responsible for the taste - and security - of the food." That said, a few juicy details oozed out like creme patissiere from a flaky eclair. French President Francois Hollande hates artichokes, and former French President Nicolas Sarkozy had omitted the cheese course from the Elysee Palace menu to "save time" (sacre bleu!, cordon bleu!). Even so, Sarkozy restored the cheese course before dessert for the bimonthly visit of German Chancellor Angela Merkel, according to Bernard Vaussion, chef of the president of the Republic of France. Prince Albert II, reigning monarch of the Principality of Monaco, visits the kitchen each morning to approve the meals and serves his organic garden vegetables in his country home outside of Monte Carlo when he is not hunting in France, according to the prince's chef, Christian Garcia, who is also president of the chefs club. "It is such a pleasure to be the prince's chef because he wants to be a part of the process and comes into the kitchen in the morning to discuss the menu," Garcia said. On a more serious note, Bragard said that the point of this week's meetings was to show that food unites people. The club was proud to have hosted a meal on a previous trip that was the "first time that the Palestinian and Israelis chefs put on the same white jackets, a symbol for peace." Garcia clearly understands the art of diplomacy. "At home," he said, "my wife is the chef." But this trip of the chefs from the White House, Buckingham Palace and other seats of power wasn't all ceremonial. In association with City Harvest, a New York City charity that collects unused food from restaurants and distributes it to the homeless, the chefs jointly prepared a charity lunch Saturday for 200 homeless New Yorkers in a soup kitchen, who feasted like kings and queens for a day. Men JianZhong and Liu Qiang, chefs of the "Great Hall of the People" in Beijing, did not speak English but helped dish out the joint meal. On Monday, the chefs arrived at the U.N. and met with the press corps, Secretary-General Ban Ki-moon and Monaco's mission to the world body. No food was served, but the sight of more than 20 chefs from 19 countries festooned in their kitchen whites with towering toques rivaled any U.N. diplomatic reception, where traditional national dress always makes for a colorful event. The chefs boarded a bus Tuesday for Amish country in Lancaster, Pa., to feast on a homegrown organic meal and then are expected to visit the White House Thursday to meet Mr. Obama and the State Department Chefs Corps for what they called "gastronomic diplomacy." Bragard knows more than just recipes for haut cuisine. He quoted the French diplomat Charles-Maurice de Talleyrand, who said to Napoleon, "Give me good cooks and I will give you good treaties." But, reporters asked, why not reveal the favorite meal for the queen or Mr. Obama? "Once, we explained that a president loved tete de veau (a delicacy of calf's head), and then everywhere he went he was served it ... over and over ... so we don't like to give that away anymore," Bragard said. No one, however, cited that famous royal, Marie Antoinette, who famously suggested the breadless poor simply eat gateau. Meeting the chefs, Ban said, "I have tasted seal meat and reindeer in the Arctic Circle, the local specialties of Mozambique, and a banquet of fish from the Euphrates Delta," and added, "I have eaten hurried sandwiches on U.N. flights." The secretary-general also emphasized that he launched the Zero Hunger Challenge to encourage partnerships that will help every man, woman and child enjoy the right to food. Flanagan, the chef to Queen Elizabeth II and the club's vice president, noted the two traits needed to be chef for a world leader: "the passion for cooking and discretion, which is something practiced by every one of the chefs here." Sometimes, Garcia said, there are times when a meal seems to be a flagship of history. "One of the most memorable meals in the Palace in Monaco was for Nelson Mandela," he said. "After all he had been through, it was an amazing moment in history." If only the delegates to the U.N. could replicate this gastronomic harmony instead of the more usual "too many cooks in the kitchen" chaos that characterizes diplomacy today.